This program would take the printer .dat files from the Arrow Financial’s Software and read in all the fields and data. Then using this information the program could decided where to send the .dat file and/or even change the data. 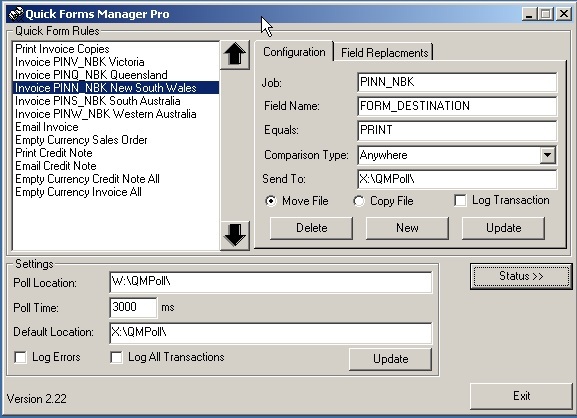 The Quick Forms program would then pick up the .dat file and print it out with the modified data. As Arrow Financial’s printed its documents to an external .dat file for the secondary program “Quick Forms” to pick up and then turn it into a printed form using the data contained within the .dat file. This allowed Arrow users to modify the form designs for their print outs. I was able to take advantage of this fact to create the Quick Forms Manager which allowed for multi site printing of forms and even add features that wasn’t available in Arrow. This software was used by many Arrow Financial’s customers mainly in multi warehouse businesses.